The best book I ever read in high school was Manchild in the Promised Land by Claude Brown. The second-best book I read in high school was ... uhh, I forget. I remember reading Where the Red Fern Grows, but I think that was in junior high. Big Dan and Little Ann. What great dogs they were! Jeezus, I was sad when Little Ann died. And then Big Dan died. I've been a sucker for sad story endings ever since. Especially animal stories. Yeah, that's right, because now I remember reading Jonathan Livingston Seagull. What a great seagull he was! And oh, yeah, I read Love Story. Remember that sappy line, "Love means never having to say you're sorry"? What a crock. Anybody who's ever been in love knows that being sorry is often the only tangible thing one gets from being in love. As I sit typing, my youngest son sits under a lamp, multi-tasking between his Twitter feed and one of the books he's required to read this summer as he heads to his senior year at Judge Memorial Catholic High School. The book is Your Inner Fish by Neil Shubin. I read the back cover. It has something to do with how this fellow, Shubin, discovered a fossil that he believes is the fish-to-human link that traces all of us back to the depths of an ancient body of water. Our hands evolved from fins, he says. My typing skills prove his point. In 1972 or so, our English teacher, Jean Wollam, let us vote on a book to read for her English literature class. I suggested Manchild in the Promised Land because I'd already read it. It won. If you're familiar with black youth coming-of-age stories similar to Brown's that emerged during the 1960s, you know some of this book isn't pretty. To appease parents, Ms. Wollam had us read most of the book. Our assignment was to read it, but skip pages 62-65, for example (because there may have been a masturbation reference), and to also skip pages 104-107 (because of references to marijuana). And so on. We read all the pages anyway. Now, there sits Mikey, reading a book about evolution. I'm thankful for Judge Memorial for that in the same way I remain deeply thankful to Jean Wollam for letting us open our own frog eyes and think with our own fish brains. We go nowhere if we are not allowed to see beyond our mother's apron. We climb no hill if we rise no higher than our daddy's back. Judging by every time I hear a squabble about home teaching or core curriculum, I think we're just going nowhere, training minds to mindlessly stack hamburger patties at McDonald's rather than training minds to wonder what might happen if the cheese went below the patty instead of on top of it. I'm amazed at what Judge Memorial includes as required reading: The Scarlet Letter, The Life of Pi (again, hats off to Judge for not fearing the powerful merge of religion and intellect! ), The Alchemist, Huckleberry Finn, Into the Wild, Things Fall Apart, Funny in Farsi, Cannery Row, Their Eyes Were Watching God, Outliers and Aftershock. There's plenty more. A few seemed so interesting, I started reading Mikey's books along with him. 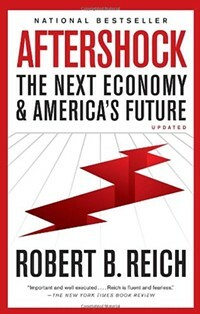 Most recently, I picked up Aftershock by Robert B. Reich. Aftershock made understanding economics fun—well, as fun as it can be to understand why the poor, as Jesus said, will always be with us. In that Bible passage (King James Version), Mark 14:7, Jesus also says of the poor that "whenever you will, you may do them good." In Aftershock, Reich says exactly the same thing. Sort of. Reich rightly credits Utah Mormon Mariner Eccles with providing the ideas to the Franklin Roosevelt administration (via his role as chairman of the Federal Reserve) that got America out of the Great Depression and that later led to decades of American prosperity. Eccles, a self-made man of tremendous wealth, was a proponent of such heretical things as livable wages for workers and increasing government debt while also decreasing interest rates to stimulate spending. I don't understand that either—but I do understand how Reich explains it: The economy is just another poker game. Eventually in poker, all the money ends up with just one or two players. The remaining players must quit or borrow from those other two (at onerous rates). The winners thus get even more money. The losers have no way to access more money, and often cannot even get back in the game. Our society splits in similar fashion into a great financial inequality gap that our government eventually has to pay for, ironically by taxing at disproportionate levels the very masses that have little left to be taxed. Wall Street wins the poker game, and the American Dream of sustaining an upwardly mobile (not wealthy—just happy) middle-class lifestyle is extinguished. Wealth is not the villain—the villain is the unwillingness of too many to give even the slightest bit back. Jesus knew what would happen next in this world that will "always have poor among us." And he paid a pretty high price for that, leaving his followers behind with "But me you have not always"—cashing in his chips, if you will. Now, we crucify the poor in a different way. We let them believe there's hope. That's a great thing, hope, but it doesn't pay the bills. If you're reading this, you, too, are among the poor, same as me—don't kid yourself. You simply eat better. Aftershock is a really fine book. It reminded me to think like a teenager again. I'll remember this one.